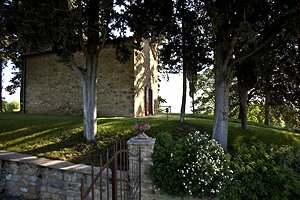 Elegant holiday villa close to San Gimignano (Siena), in Valdelsa. 6 sleeping accommodations, swimming pool, garden, air conditioning. 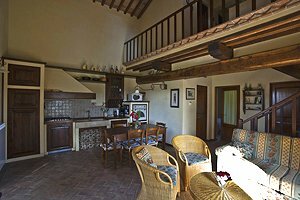 The elegant villa is situated in Siena countryside, in Valdelsa, in Casaglia, a small village between San Gimignano and Poggibonsi. 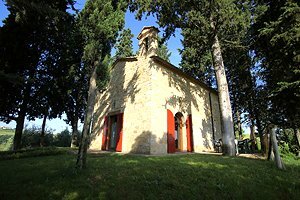 The villa is an excellent departure point for visiting the most famous towns in the Florentine and Sienese Chianti and other Tuscan tourist destinations, such as Certaldo, Volterra, Colle Val d`Elsa, Siena and Florence. 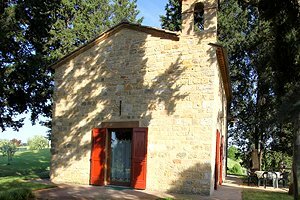 In the origin the building was a church built in the 12th century. 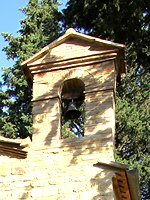 Prior to being transformed into a villa, the church was deconsecrated and used as a sighting tower and a meeting-place for peasants. 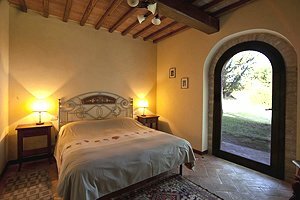 Renovated with an eye to preserving its original structure and using local materials, the villa features terracotta-tiled and beamed ceilings and is furnished in the traditional Tuscan style. Around the building stretches a garden furnished with chairs, tables and a concrete barbecue for guests to have their meals al fresco in the shadow of the numerous cypresses scattered in the lawn. 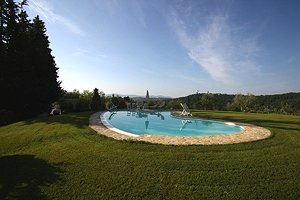 The private swimming pool (7x14 m; depth: 1.50 m) situated on a hill at the back of the building, about 200 metres from the house, is open from May to October. The pool side is furnished with sun loungers, deck chairs, sunshades, a table and a shower. 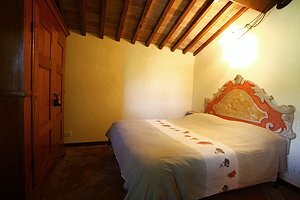 The villa offers 6 sleeping accommodations in 2 double-bedded rooms and 1 room with two single beds, and 2 bathrooms. 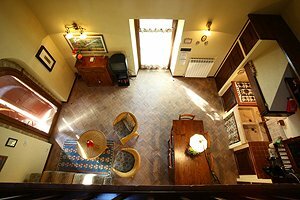 The large room with direct access to the garden on the ground floor is divided into a living area with CD/DVD player, satellite TV, armchairs and sofa bed and a fully equipped kitchen area. On the ground floor are also a laundry room, a double-bedded room and a bathroom with shower. 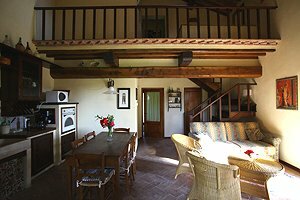 A wooden stair leads to the upper floor, where are a room with two single beds, a double-bedded room and a bathroom with shower. 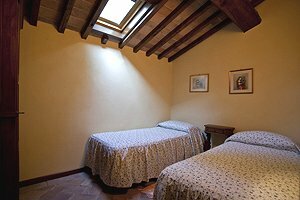 The double-bedded room on the ground floor has direct access to the garden. 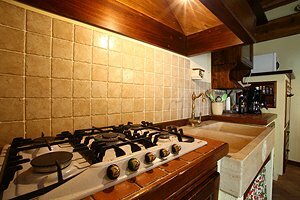 The villa is provided with swimming pool, wood-burning oven, barbecue, satellite TV, CD/DVD player, air conditioning, oven, microwave oven, electric grill, fridge, freezer, toaster, American-style coffee maker, dishwasher, washing machine, iron and ironing board. 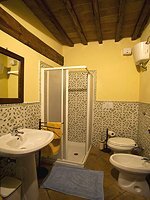 The rent includes the weekly change of swimming-pool and bath towels and of bed and kitchen linen. A cot bed and a high chair are available for those guests who request them at booking. 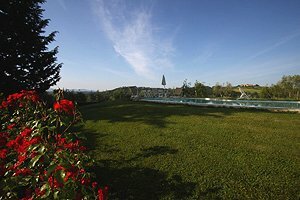 The villa is the ideal accommodation for sporty guests, who can rent motor-scooters and bicycles in San Gimignano and play bowling in Poggibonsi. 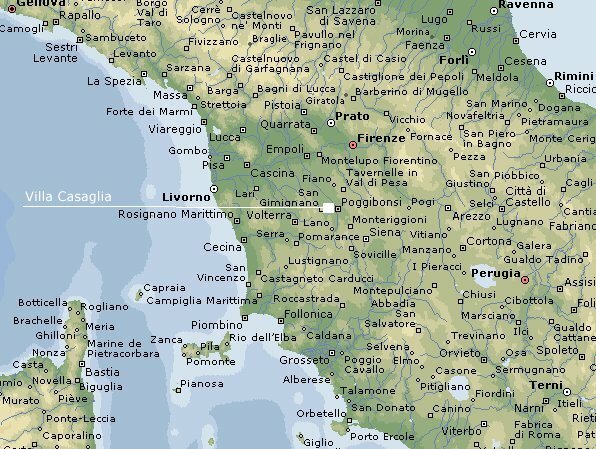 A riding stable and the Tennis Club Staggia Senese are just a few kilometres from the villa. 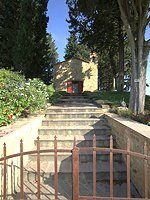 The Golf Club Castelfalfi and Florence Golf Club Ugolino are within easy car distance.